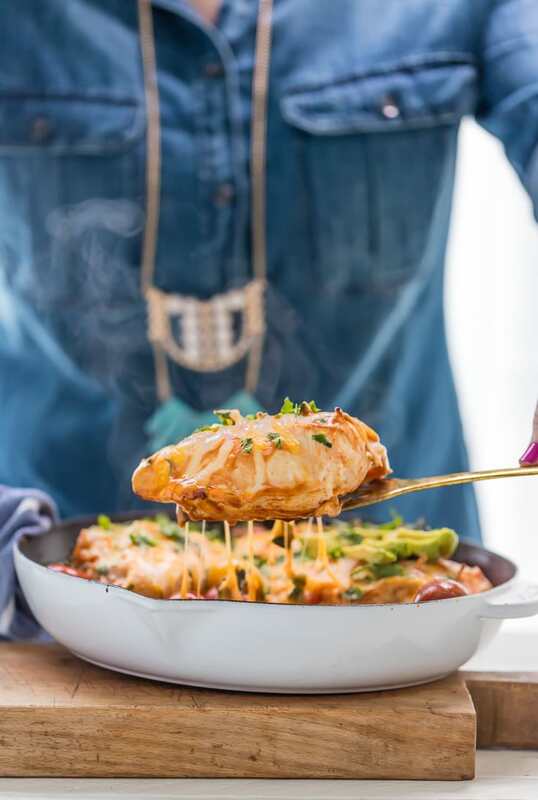 This Enchilada Stuffed Chicken Skillet was one of those recipes that hit me late and night and made me wide awake. Does that make me a dork?? (YES). Let's be honest, I always have Mexican food on the mind (CHEESE), but had never thought about stuffing a chicken breast with everything I love about enchiladas (RICE, CHEESE, CILANTRO, TOMATOES, ENCHILADA SAUCE), essentially making Inside-Out Chicken Enchiladas. A one pan meal that tastes like my favorite Mexican dish??! I sat up in bed, made a note on my phone, and then researched it first thing in the morning. I can't find anything quite like this on the internet, which is very rare these days. 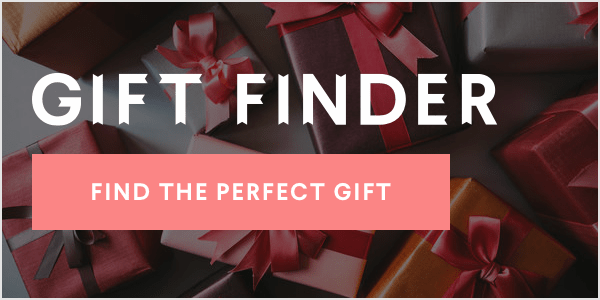 I LOVE THIS RECIPE SO MUCH and I hope you do too! I guess I can thank my cheese-loving subconscious for coming up with it!! So here's what you do. 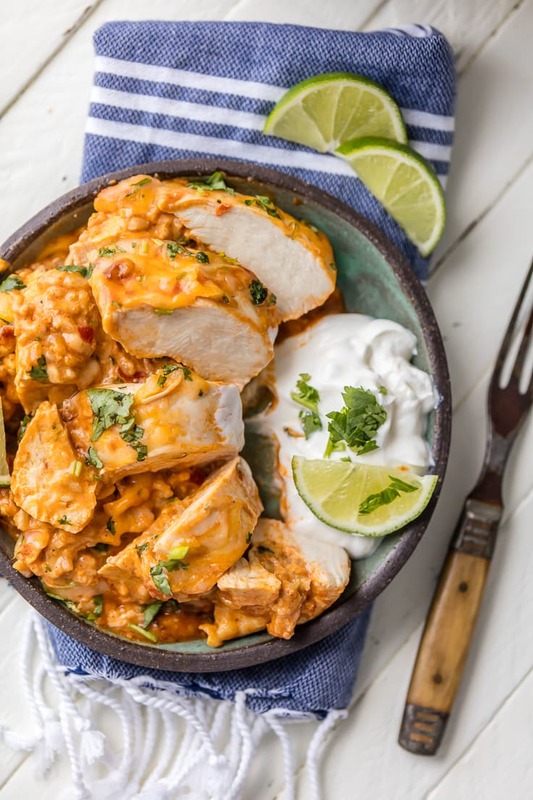 You stuff large boneless skinless chicken breasts with a mixture of rice, cream cheese, Mexican blend cheese, cilantro, diced tomatoes, and enchilada sauce. You seal them with toothpicks just to keep all that good stuff inside, and then cook the chicken in a mixture of oil and more enchilada sauce in a large skillet. Once almost done, you pour more sauce over the chicken and top with as much cheese as possible, and bake to finish the chicken. YOU GUYS. It is SO good. The chicken is moist and tender, and when you cut into it...all that cheesy rice pours out. And it is...heaven. I mean...look at what happens when you slice it. I CAN'T. 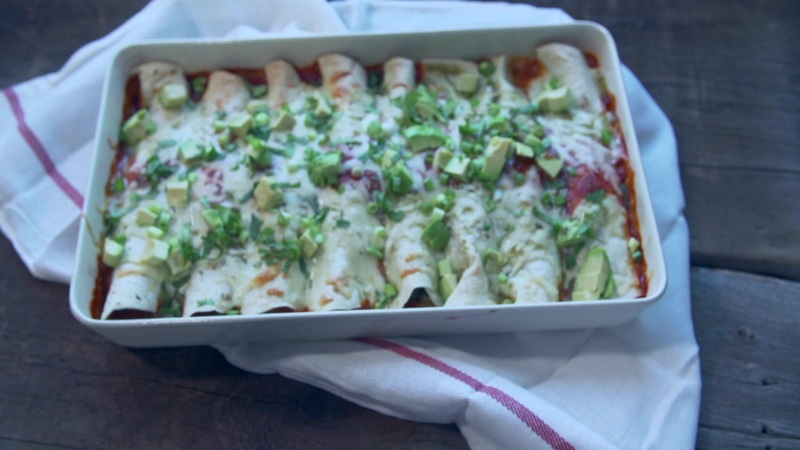 I sure do hope you love these Inside-Out Chicken Enchiladas as much as we do. Pat actually admitted that this is his favorite thing that I've made! The heavens parted and the angels sang, because he is harrrrd to please. Enchilada Stuffed Chicken Skillet FOR THE WIN! 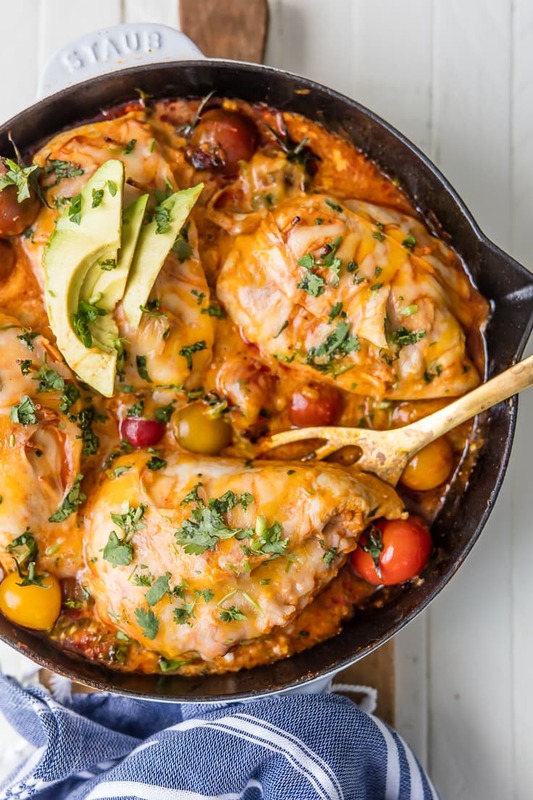 The post Enchilada Stuffed Chicken Skillet (Inside-Out Chicken Enchiladas) appeared first on The Cookie Rookie.